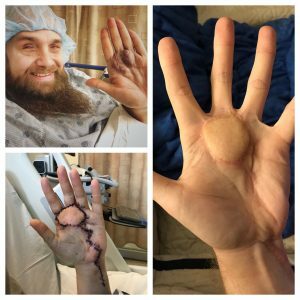 Seven months ago to the day, I was coming to in a surgical ICU, slightly overwhelmed by the pain in my hand and the disorientation that accompanies 11 hours of anesthesia. Today I went to Houston to see my hand surgeon and talk about my concerns with the next procedure I’ve scheduled (and rescheduled.) I’ve healed well, recovered strong and I’m back to all activities in full confidence. So now what? We agreed this surgery wasn’t necessary and I won’t pursue it now. It would be purely aesthetic and I wouldn’t gain any additional functionality. Plus, though much less invasive, it would still have me out for 2-4 weeks – and life is too full to manage a recovery now. Seven months ago, I had no idea what to expect. But I’ve pushed through with the support and encouragement of my unbelievable tribe. Y’all fill me up, I want you to know that!